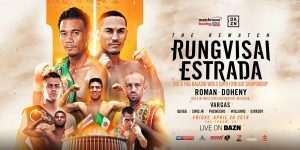 “I am extremely excited and honored to be back fighting in the US again,” says highly regarded WBC super-flyweight champion Srisaket Sor Rungvisai, who it’s been announced will be rematching Juan Francisco Estrada on April 26th. The bout will be held at LA’s Forum and will be aired live on the DAZN streaming service. “Estrada is a great fighter,” Sor Rungvisai adds, “and we had an amazing fight last year. Our round 12 was awarded Round of the Year by WBC. That is an evidence of how entertaining the previous fight was.” The first match between the two men went down last February at the Forum and ended with a majority decision win for Thailand’s Sor Rungvisai.